Katherina loves yemista and feels that cheeky is the one word that best describes her is our Young Greek of the Week. Greek Prime Minister, Costas Karamanlis, meets with the Cypriot President, Dimitris Christofias. The two day visit of the Greek Prime Minister, Costas Karamanlis, and his wife Natasa to Cyprus reinforced the strong relationship between both countries. The sale of coffee in Greece has remained strong despite the impact of the global financial crisis and the closing down of hundreds of small businesses. Greek Economy Minister Yiannis Papathanassiou remained calm despite the release of official figures which show that the Greek deficit has doubled to five percent of GDP. The First Games Festival which will celebrates games such as chess, bridge, scrabble, darts and sudoko opened in Thessaloniki over the weekend. The wife of the Greek Prime Minister came to the rescue of a journalist during their visit to Cyprus. 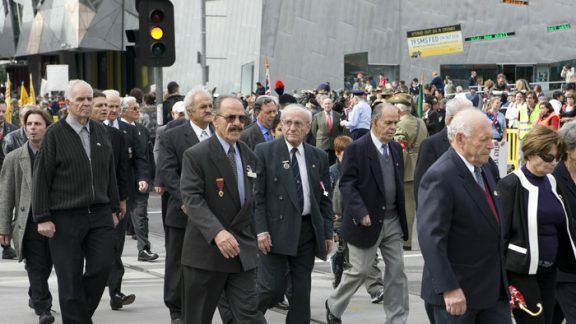 The Hellenic RSL were part of the 2009 ANZAC Day parade in Melbourne. The recent outbreak of hysteria about asylum seekers is unnecessary according to to Greek Australian advocates for asylum seekers and refugees. Experts are divided on the impact the possible removal of the First Home-Owners Grant increase in June 2009 will have on housing.